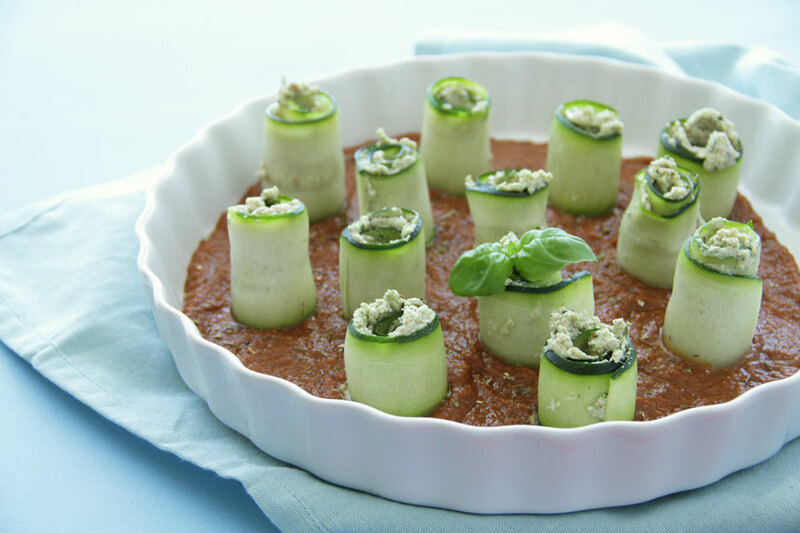 These raw zucchini roll-ups are our spin on traditional ravioli. We realize that pastas often become a staple food for new vegans and vegetarians, however most of the time this kind of fuel is heavily processed, fibre deficient, leads to spikes in blood sugar levels and has very little nutritional value. We wanted to offer you some extra healthy alternative to a traditional pasta and decided to make these raw light and green rawviolis. Also if you ever wonder what to do with leftover almond pulp, we have a solution. Make a creamy ricotta like filling. Totally delicious inside these roll ups! Zucchini is one of the very low-calorie vegetables; provide only 17 calories per 100 g. It contains no saturated fats or cholesterol. Its peel is an excellent source of dietary fiber that helps reduce constipation and offers some protection against colon cancers. It’s also rich in flavonoid antioxidants, which play a significant role in slowing down aging and preventing diseases with their free radical-zapping properties. Zucchini is also a wonderful source of potassium, a heart-friendly nutrient that helps moderate your blood pressure levels and counters the effects of too much sodium. It also contains essential minerals such as iron, manganese, and phosphorus. 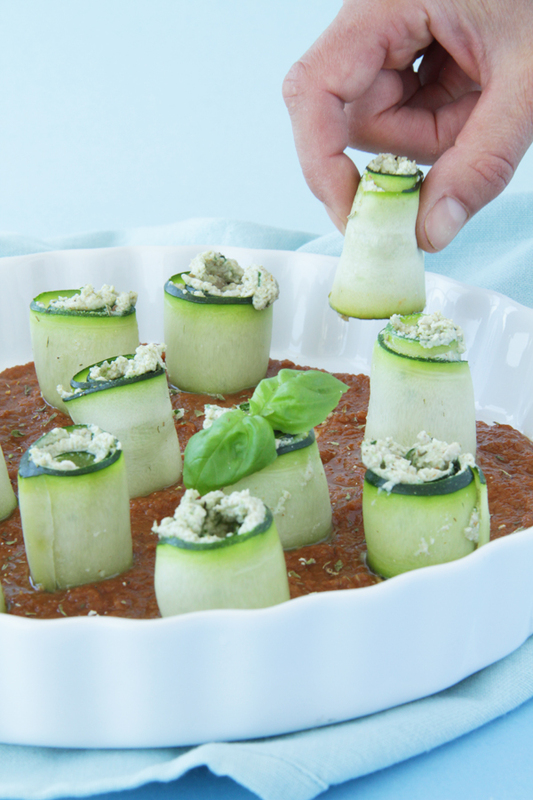 This healthy, light and vibrant dish uses almond pulp to create a creamy ricotta like filling inside these zucchini rolls. 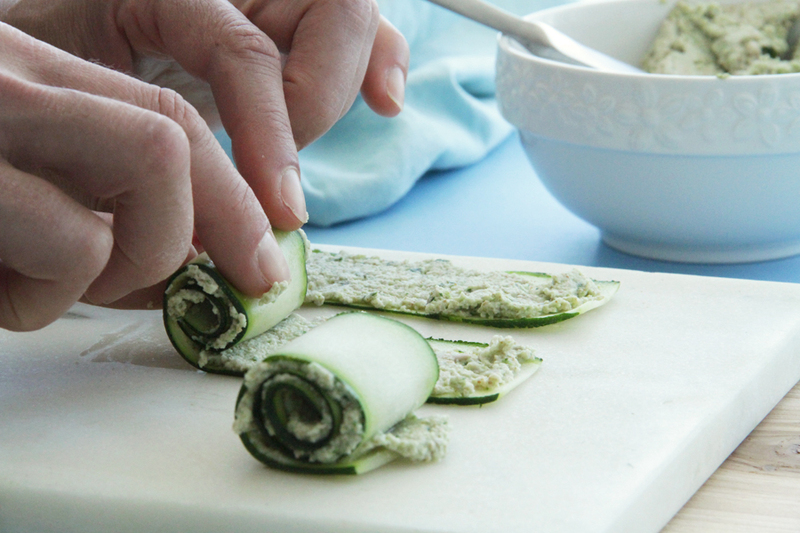 Using a vegetable peeler, run length of zucchini, forming ribbons. Set aside. mixture is just slightly chunky.Pour the marinara sauce into a deep serving plate. 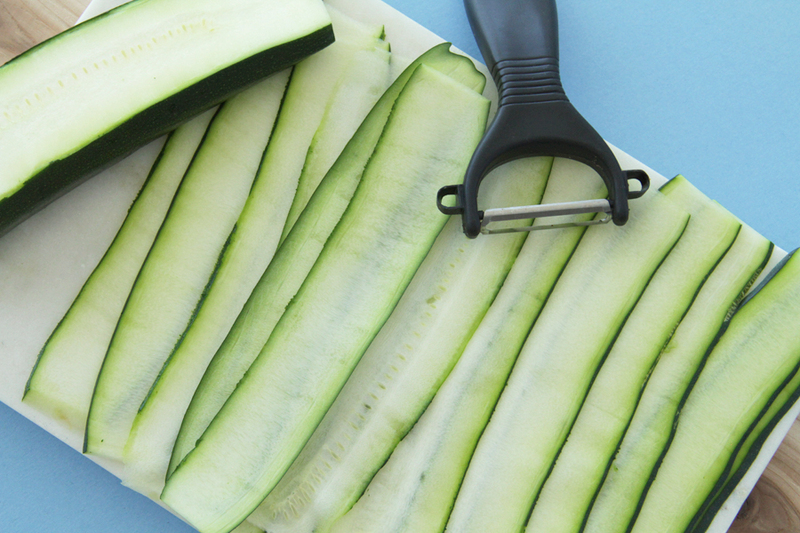 Set your zucchini slices out flat, vertically. Add about 2 tsp of the filling in a clump about 1/3 of the way up from the bottom. 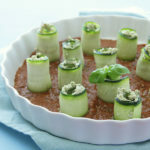 Wrap the bottom part of zucchini up over the filling, then roll to the top. Repeat until all of your zucchini slices are gone. Place the rawvioli spiral side up on top top of prepared marinara. Garnish with herbs if desired and serve. We hope you will give this light dish a try.